20130801 - Up and in to work. Didn't leave my office all day, working on fires. 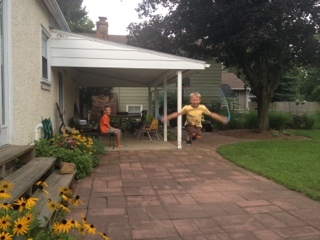 left work at 6:30... Home made some food and watched the boys jump rope, and showed'em some of my ropin skills. We ran and got gas and some movies. Home and we watched a dance movie the boys loved. Got them to bed and I watched a movie while L slept. I update the blog for all of May filling in all the missing days and pics.